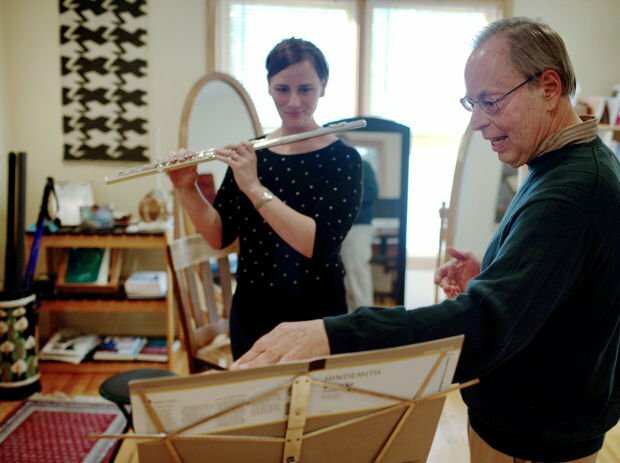 Robert Rickover works with Melissa King on relaxing her neck and shoulder muscles when she practices the flute. Rickover teaches the Alexander Technique to reduce tension-forming habits. Robert Rickover coaches flautist Melissa King on how to relax the muscles in her neck. Before she went to Rickover, King could practice for less than an hour before she was in pain. Now, she can play for three hours without problems. Robert Rickover talks with Melissa King about how the Alexander Technique helps change tension-forming habits through concentration and correction of movements that cause stress or pain. The world-weary teen gazed up at his mother. Yet another boring event only an adult could enjoy. So once again 15-year-old Robert Rickover snubbed his nose at the latest invite: a trip to 1600 Pennsylvania Ave., home of the architect of the Allied victory in World War II, a five-star general who happened to be the current president of his country -- Dwight D. Eisenhower. After all, he’d shaken Harry Truman’s hand just a couple years earlier. Why bother with yet another trip to the White House? Robert Masters Rickover grew up in a tony Washington, D.C., neighborhood down the street from J. Edgar Hoover, the only child of Hyman and Ruth Masters Rickover. And when your old man is the father of America’s nuclear navy, one of the most influential men in the country, you tend to expect White House invites one week, a British Embassy dinner the next. But how to explain all the other things firing up his radioactive imagination? A trip to his modest home in South Lincoln might be a good start. That’s where you’ll find undergraduate degrees in physics and economics from Yale gathering dust in the basement while pictures with an array of medium-sized mutts hang prominently next to his computer. Or slip into the South Street Temple most Saturday mornings and you’ll find the 73-year-old diving deep into the Torah with a clutch of friends. That afternoon, there’s a good chance he’ll be spouting lyrics from one of his favorite American poets, Mr. Hank Williams. But one passion outweighs all the others. A studio toward the back of his white, two-story bungalow near 24th and South streets, the one he’s called home for 20 years, is where it all plays out. It’s something he believes can improve people’s lives like nothing before. Something he’s done for 36 years. Something called the Alexander Technique. My neck is free. My neck is free. The phrase races through Melissa King’s head in Rickover’s back-room studio. Her goal is to stay balanced while playing Paul Hindemith’s “8 Stücke” on the flute for an upcoming performance. Right now, she’s avoiding pain that comes with hours of practicing, and Robert Rickover is her sensei. The goal of the Alexander Technique is to change tension-forming habits through concentration and correcting movements that cause stress or pain. Rickover gives instruction on how to correct bad habits and to free her from pain. Today, he’s telling King to keep her neck free and to release unnecessary tension to avoid feeling pain during performance. Before coming to Rickover, the flautist could practice for maybe 45 minutes before a migraine or physical pain arrived. Now, she can play three hours pain-free. “It’s just helped me so much,” says King, crediting the technique for the somewhat miraculous turnaround. Now, she’s nailing 16th notes with ease. But the music Rickover prefers trades a flute for a fiddle. While just a tyke, he used to sneak to the family radio and find the country station. Then he’d listen to the acoustic guitars and rich Texas voices bringing honky tonk to D.C. He loved the poetry in the lyrics and the catchy melodies that dominated what he calls quintessential American music. To this day, his desk is littered with Hank Williams’ Greatest Hits Vols I and II, George Jones’ “Cold Hard Truth” and the “Best of Conway and Loretta” – all on cassette tape along with countless CDs. But right now, his mind isn’t on the soothing lyrics of Hank Williams. It’s on releasing King’s tension. Erasing pain. This summer, King broke her knee jogging. But the mother and flute performance graduate student at the University of Nebraska-Lincoln didn’t really have time to stay off her feet. Her 3-year-old son keeps her too busy. She turned to physical therapy, but the exercises weren’t too helpful. She needed a new experience. Maybe an accident. Maybe dumb luck. Either way, Melissa King had stumbled upon more than an average-sized man fond of wearing bland sweaters, collared shirts and brown leather shoes. She’d discovered an influential Alexander teacher, one of only two in Nebraska. The transition from Yale-educated physicist and economist to Alexander guru had its share of twists and turns. In 1977, Rickover was a research economist for the provincial government of Ontario, Canada. He’d taken a roundabout way to get to Toronto. After working on a graduate degree at MIT, he joined the Federal Reserve Bank in New York City in the late 1960s. Weary of worrying about New York City crime, Rickover jumped at the chance to move to Toronto, where he got set up with a “cushy” economist gig. Soon, however, he developed a multitude of nervous habits. He was often tense. And the job was monotonous – it benefited no one. He’d stumbled across a magazine article about the Alexander Technique and then a coworker told him about the success she'd had. He decided to give it a try and after his first lesson, he knew he’d hit on something amazing. What he did notice one brisk Toronto day was that his clothes didn’t fit as well. He was about an inch taller because of his straighter spine. And his hands would just glide right out of his pockets as he walked. So he scrounged up all the books he could find. He continued instruction on how to improve his posture. And then he realized something else: The work released tension. It wasn’t monotonous. And it could benefit anybody. In 1978, on a calculated whim, Rickover left his job and Canada and moved to London to study at the School for Alexander Studies. On a recent Saturday morning, Rickover walks through the back door of the South Street Temple and down the stairs to a frigid basement. He sets out food before anyone else arrives for a weekly Torah study. This is where he comes to think about the big questions in life – along with some good-natured banter between serious discussions. “It’s like an intellectual session without intellect,” says weekly participant and friend Robert Friedman. The topics this Saturday bounce from the aftermath of Joseph and his coat of many colors to climate change: all focused around the complexities of truth. For the most part, Rickover quietly mulls over the questions with a plate full of pistachios, crackers and hummus, occasionally offering his opinion to the 18 participants. Rabbi Craig Lewis asks for each person’s definition of truth. This is his favorite part of the 129-year-old congregation. It’s a way to look at faith and life through an objective eye with a diverse group of people, because not everyone in the group is Jewish. From a framed photo in his studio, Marjorie Barstow watches the sensei guide King’s head upward so she doesn’t lean too far forward. She’s the woman who brought Rickover to Lincoln – the one who has most influenced his thoughts on the Alexander Technique. In 1979, as Rickover was working through his studies of the technique in London, he decided to come to Lincoln for a training session with Barstow. She was legendary in the field, a former pupil of the founder. So Rickover arrived in Lincoln expecting a few short informational sessions. He certainly didn’t think he’d be back. But the session changed his mind. In Lincoln, Rickover learned different elements of the technique and how to better teach large groups of students. At the end of the day, he’d be physically wiped out. Meanwhile, Barstow wanted to have a night on the town. Rickover graduated from the London school in 1981 and soon opened a thriving practice in Toronto. But increasingly his mind was elsewhere. Finally, in 1990, he up and moved to Lincoln to help out Barstow with a few workshops. He met his wife, Anne, shortly after coming and he’s stayed, making annual trips to Toronto to teach since. In truth, not everyone embraced his passion. “(My father) was quite puzzled by all this,” Rickover says. That would be the man who worked for Truman and Ike and JFK on the U.S. nuclear navy. The man who was invited to all the Washington galas and who labored tirelessly in the name of national security. The man who made an effort to take a weekend walk with his son every time he could. So the man eventually did what any curious father would: He went to the Library of Congress and requisitioned the four books Alexander wrote as well as some other technique literature. The books did little to sway the admiral. However, the father finally changed his mind after meeting a few people the technique benefited. And through it all, he was supportive. Like many fathers, he tried to maintain normalcy in a childhood more complicated than most. But perhaps the complexities of that childhood have helped him become a leader for something he advocates with great passion. He won’t rest at spreading Alexander Technique information -- which he’s doing now via Facebook, the Internet and blogging -- until it’s as popular as yoga. Until people are using the specific methods of Alexander to erase pain from their lives and move with greater ease. Follow us on Facebook for featured articles, photos and exclusive content and offers. Follow the Journal Star on Twitter for the latest breaking news and updates on developing stories. New adoptables in Southeast Nebraska. Pick your new dog or cat!